CS5 has so many improvements across the entire product line. But, one of the best is a continuation of a feature from CS4 called Dynamic Link. 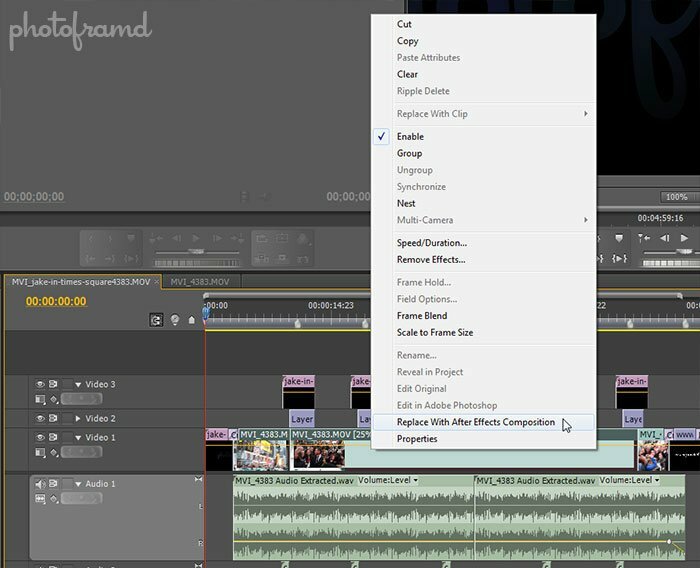 By using Dynamic Link, you can jump between Premiere Pro CS5 and After Effects CS5 without having to render sequences or compositions! Now that’s streamlining your workflow! In the above example, I started in Premiere Pro CS5, select two trimmed movie clips. By right clicking on the clips, I used the Replace with After Effects Composition to send them to After Effects CS5. (After Effects does not even have to be open beforehand.) In After Effect, I am asked to name a new composition and then the selected trimmed clips automatically appear carrying the settings from the Premiere. Just do your work in After Effects, save the composition and jump back to Premiere. Simple! 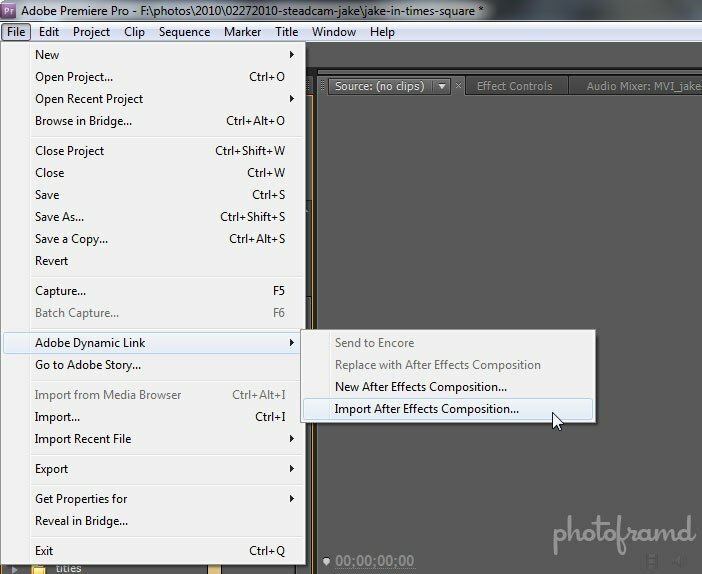 Adobe Dynamic Link is also available in both Premiere CS5 and After Effects CS5 from the File drop-down. You can either start with a brand new file or import an existing one. A couple issues to know! 1. Dynamic Link appears to work one way at a time. Making changes in one program and sending them back to the other works great. However, making continuous changes in both programs will eventually break the link. Just start a new dynamic link and you are good to go. 2. Be sure to save with each program jump!!! When I reopened the above file in Premiere the next day, Premiere lost track of the modifications in After Effects. But, because I save the After Effects compositions, I just clicked on the assets in the Resource Panel and Linked Media. 3. you will need a 64-bit operating system with plenty of Ram to keep juggling all of these files. But, if you have it, flaunt it and save some time in the process! This CS5 video by John Dickinson from Adobe Australia provides a great explanation of the workflow. This CS4 video by Adobe Evangelist Jason Levine provides another look jumping between Premiere, After Effects and even Photoshop. And once you’re very impressed with Dynamic Linking between AE and PR, just create a DVD in Encore without even exporting in PR, directly through dynamic link. It’s one of the better technologies of the Creative Suite! I have not used Encore. Too many other new things to play with 😉 Thanks for the recommendation. I “Replaced with After Effects Comp” a clip in a Premier Pro sequence. I did my thing in AE..saved..the clip in PP is now the one i created in AE. No problem. I will render the sequence in PP and then save as well. BUT…when i close down everything and JUST re-open PP to work on the rest of the sequence…my AE comp link is broken and the clip is red like it is looking for media. I did try to “Link Media”, but the box it pulled up didnt really allow me to do anything. When I then start AE and load the comp and THEN “Link Media”, it comes up in the PP sequence. I hope i explained this well enough to solve my dillema. Am I not doing something correctly to not have to open AE to see what i made in the PP timeline or Program Monitor? Wow, it’s unusual (and difficult) for me to admit to being dumb, but . . . I’ve been scratching my head on how to do this for a while now. Thanks Man!! !